The radio series This I Believe began in the 1950's. Created by Edward R. Murrow, the series examined the beliefs that sustained the most ordinary and extraordinary of Americans. The series was revived in 2005 and is now heard on several public radio programs including Tell Me More, All Things Considered, and Morning Edition. The radio series This I Believe began in the 1950’s. Created by Edward R. Murrow, the series examined the beliefs that sustained the most ordinary and extraordinary of Americans. 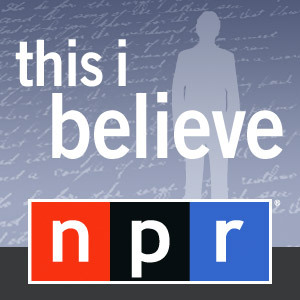 Today we heard excerpts from the This I Believe essays of Colin Powell, Jackie Robinson, Kim Phuc, and more. Series host Jay Allison joined Marc live to discuss the series and what it tells us about America today.